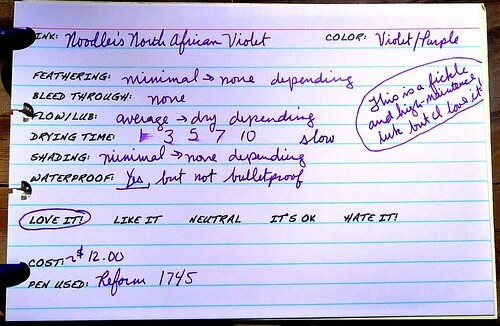 When Nathan released the V-Mail line I was Immediately drawn to North African Violet (NAV). The fact that the V-Mail line was somewhat waterproof made this ink even more appealing. Still, I did not get a bottle of it until a couple weeks ago. If you research this ink you will see occasional mention of issues with it being slow flowing, staining, and generally difficult to rinse out of pens. A friend of mine on FPN also warned me about difficulties she had rinsing NAV from her Visconti Traveling Inkpot. So, just to be safe, I loaded it in a Reform 1745. This Reform is both easy to clean and cheap enough that I won’t be heartbroken if it is damaged. Color. This is a gorgeous, vibrant, saturated violet color. Waterproof. This ink is waterproof. I consider this a major pro of this ink. It loses little to no color. I tested this by soaking a sample, holding a sample under running water, and doing a water droplet test. The results of the droplet test are below. However, be advised, this ink is NOT BULLETPROOF. I don’t always need bulletproof inks, but I’m always looking for waterproof inks; I’m a bit clumsy. No bleeding. There is a little bleeding on cheap copy paper, but it is tolerable. Honestly I just about never use cheap copy paper, so it’s not an issue for me at all. No feathering. Same as above. No nib creep! I hate nib creep. I couldn’t get NAV to creep if I tried. My FPN friend reports the same. OCD nib wipers can ink with confidence! Some shading. This ink is not the best shader, but there is some shading evident. Reduced flow? If you need an ink to tame a firehose this may be the one for you. See below. Slow drying. This may not be the ink for left-handed folks. This ink takes anywhere from 10-15 seconds to dry and remains smudge-able for a few minutes. Reduced flow. This actually isn’t a big issue at all. I still find this ink entirely useable, but it does slow down the flow a bit. This Reform usually writes about 7/10 in terms of wetness. With NAV it is writing about 5/10. This is not a huge difference, but this does indicate that this ink is best suited for a wet writer. Lubrication is average. Sensitive to mixing? I have not tried to mix this ink with any other, but from what I understand, this ink does not play well with other inks. If you want to use it in a mix be sure to do a test batch first and let it sit for 24-48 hours just to be sure it doesn’t throw precipitants or turn to sludge. Just to be on the safe side, you’ll want to be sure you have thoroughly rinsed your pen of any other color before you fill it with NAV. No staining issues for me. This ink clings, so I was concerned I’d have staining, but it rinsed out of the Reform with no problems. The ink window is just fine. However, the Reform has a black section and a black feed. I do note a bit of a reddish caste on the feed that could indicate a little staining, but I’m not sure. I’d advice that you use care if you are planning to use this ink in a pen with a light colored section. Just like all purple ink, it may stain. No rinsing issues for me. This ink rinsed from my pen with no problem whatsoever. It actually seems to be one of the easiest ink to rinse out of the ones I’ve tried. The pipette I used now has a purple caste, but honestly that is not surprising. I love this ink. 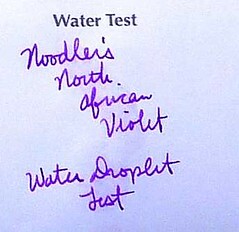 I’ve been searching for a waterproof violet purple ink, and this one fits the bill perfectly. Yes, it is a bit high maintenance, but the pros out weigh the cons so far as I’m concerned. In addition, the cons are not so egregious as to damage my pens. I’ve presented this information as clearly as I can. I’ve made my mind up about this ink, so now I leave you to come to your own conclusions. PS: If you haven’t yet, please take a moment to answer the poll question to your right. Thanks! Is it me or do purple inks all get that kind of reputation for staining? I have an older bottle of Omas Purple that actually exhibits that attribute amazingly. It stains anything it comes in contact with and never comes out! I wouldn’t be surprised if it could stain air. Right now I’m trying some Diamine purple that a friend kindly gave me a sample of and seeing if that will make me love or hate purple ink again. Great and thorough review of an ink I have been very interested in trying! I have the same experience of purple inks being almost hopeless when it comes to staining and cleaning most as TAO. 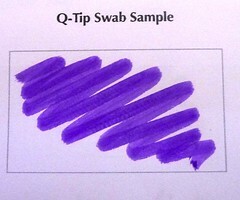 Nevertheless – I really enjoy purple inks and keep the worst offenders in my c/c pens. What a gorgeous color. I have to agree that purple inks seem to stain more than other colors, but my Omas Violet hasn’t stained anything I’ve tried it in and it’s a lovely color as well. Staining or no, I love purple and violet inks! I love this ink! I currently have it loaded in my Visconti Rembrandt.